The traveling museum exhibition "Chuck Close Prints: Process and Collaboration" is currently being exhibited at London's White Cube Gallery, and several fresh publications from Magnolia Editions have just been added to the show, including brand new prints and tapestries. 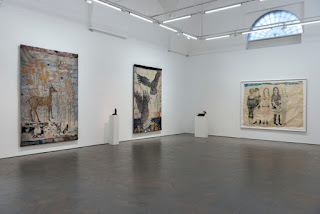 Installation view of "Process and Collaboration" at White Cube; the tapestry version of Self Portrait (Yellow Raincoat) hangs at far left. For those who are fair-to-middling, or simply a bit nothing, in their opinion of Close, they will, I believe, be deeply impressed by this travelling survey of Close’s prints. [...] Unlike Warhol’s Superstars, in which the concentration of the lens for minutes at a time strips the subject of its mask, in Close’s work we interrogate the mask presented in a snapshot that took a second to take. But the snapshot remade reveals its own fascinations. The face becomes vast, virgin territory and we its explorers. Don’t miss this show. From Leonardo on, art [has] been about revelation, portraiture allowing us to look into people's souls. In this fine exhibition's three big rooms, we see Close using every strategy of representation known to man only to end up by representing nothing, least of all himself. This isn't the glib nihilism of a Postmodern artist, but the horror of an instinctive traditionalist who has looked and looked and, at last, seen nothing but the reflection of his own glasses. [...] Yes, the Close who emerges from four decades of print-making, the lesser known part of his oeuvre, is more intellectual than you might have guessed from his paintings. But he is also more passionate. [...It] has always been easy to be impressed by [Close's] large-scale works. As something of a happy and willing determinist, he has always taken into account his limitations and allowed them to direct how he creates his portraits. However, it is only by revealing his "Process & Collaborations" that Close’s portraits can be fully appreciated – something that this exhibition, now some 40 years in the making, does extremely well. [...This] is the first time in a commercial gallery I have felt like I was in a museum. [...] It will be interesting to see if this didactic tone in exhibitions will continue alongside the gallery's education programme and see it begin to encroach into the territory of public contemporary art galleries like the Serpentine and the Whitechapel. [...] In the meantime, go to the Close show - it's a real revelation. For East Coasters unable to see the show in London, Close also has a unique exhibition of photo maquettes at Eykyn Maclean Gallery in New York City from April 16 through May 24, 2013. And for those on the West Coast, "Chuck Close: Works on Paper 1975-2012" runs through March 31, 2013 at the Monterey Museum of Art-La Mirada... or you can always make an appointment to visit Magnolia Editions for a more intimate look at the complex processes behind Close's editions.